DianeSchwobZubrick: What Should I Gocco First? What Should I Gocco First? 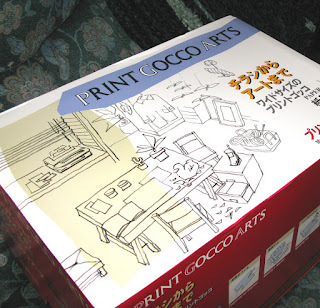 Well, the beautiful new Gocco - see the post below - is still sitting in the box in the living room. I have blogged about it, shown it to my fellow art teachers, read the "New Gocco Guide" and the instructions - and put it all back in the box. What is this phenomenon that I as an artist go through so many times? I get so excited about a medium, whether it is Precious Metal Clay, Fused Glass, or Gocco. I spend countless hours researching the medium on the web, buy books on the subject and admire other artist's work. I finally order the supplies, anxiously await their arrival, examine it all - then I always procrastinate making the first piece of art. With me it is always the fear of failure, the question of will it sell and then wondering if I will continue with it. Perhaps I am over thinking and I should just plow ahead for arts sake, forgetting about the failure, salability, or if it will be a part of my life. I need to JUST DO IT! So what shall I Gocco first? I have bought cardstock for cards, journals to print on, and paper for prints. I should just keep it simple - I always tend to go overboard with anything I do. 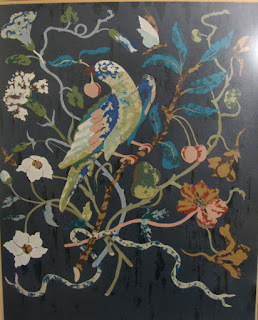 My first silkscreen (below) in college was 20 colors! What did YOU Gocco first? Leave a comment and share! I have the PG5, I remember diving into that one, being a little nervous. I drew something very quickly (a tree and sun) I was so excited! Then, I made a couple of prints and ended up ruining the screen by washing it. I still haven't gotten too adventurous with it. I haven't used multiply screens to create an image, but made lots of stationery and wedding stationery, a couple of tees too. But, you'll never guess this~ I have my new PG for Arts sitting in my living room right now....the same as yours. I am totally intimidated by it! I know I'll figure it out. But, my gosh it's big and there is extra stuff. I have no idea what I want to gocco! I want to do something, just anything to get it over with. Then I think I'd like to do something with at least three colors to the print. I'm a gocco mess right now! I have never goccoed before, but have already dreamed about getting one! I think my first thing that I would do would be some sort of 'thank you' screen for me to make cards that I could include with my orders. Good luck with your gocco...don't worry about if your first screen will be a masterpiece! Crafting is learning! Oh my gosh, I am totally the same way!! I too got into precious metal clay, my husband got me the whole kit and stuff, I made one pendant and then I never touched it again. I just packed all that stuff away to make room for my PG-11 (after waiting 15 years to finally order one!!) And that sat around for almost 2 weeks before I finally jumped in. I am still not completely satisfied with what I made (a Greetings from Brooklyn card with a photo I took of the Brooklyn Bridge I manipulated and a Mom card to hand out for potential playdates for my daughter). But I am trying not to let it get me discouraged. And I'm still debating whether to buy the New Gocco Guide book.